Van Wert City Council adopted legislation on Monday to set up an Energy Special Improvement District (ESID) within the city limits. The ESID will allow local companies to receive financing for energy-efficiency projects as part of the Property Assessed Clean Energy (PACE) program. Van Wert Area Economic Development Corporation Executive Director Stacy Adam noted that the program allows companies to receive funding to make energy efficiency improvements to their property and pay for them via assessments on their property taxes. She added that the program can assist with updates to existing buildings or installation of energy-efficient systems in new buildings. “The true benefit is that improvements can be made without upfront cost to the owners,” Adam said. City Council unanimously approved three pieces of enabling legislation for the ESIDs and PACE program during Monday night’s meeting. Van Wert Health is planning to use the program to install LED lighting replacement in the hospital parking lot. The improvements are expected to result in energy savings of 20 percent or more annually. Van Wert Health will then repay the loan and financing costs in semiannual payments, beginning in 2020 and ending in 2021. 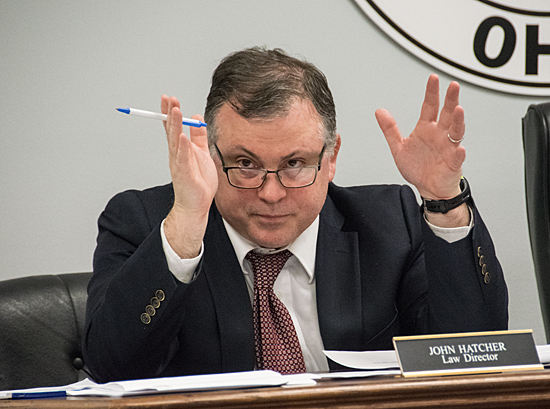 The ESID is overseen by a local board of directors that review future projects within the district, which is encompasses the Van Wert city limits. Board members include Van Wert Health Chief Financial Officer Karen Shadowens, Van Wert Mayor Jerry Mazur, City Councilman Joi Mergy, Adam, Van Wert Health CEO Jim Pope (interim member), and Van Wert Federal Savings Bank President Mark Schumm. According to the ESID agreement, improvements must be made at properties within the city’s boundaries and have an estimated useful life of at least 15 years. Eligible projects include energy-efficient windows, boilers, lighting, HVAC systems, roofing, and building controls. All costs associated with the improvements, including planning and equipment, are paid upfront through ESID and the Northwest Ohio Advanced Energy Improvement District, which receives money through federal funding or bonds via the Toledo Port Authority. Funding is limited to projects costing from $25,000 to $9 million, and cannot exceed 30 percent of the total value of the project property. Adam stressed that neither the city nor county would be affected financially by the project, since funding for the project comes from the port authority. PACE projects are approved through an application process, Adam noted, adding that several other projects are now being considered for PACE funding. In addition to the three ESID and PACE-related measures, Council also approved an ordinance authorizing Safety-Service Director Jay Fleming to advertise for bids and let contracts for the city’s annual street painting project, as well as a resolution allowing the mayor to sign an application to transfer property at 901 E. Main St. from the Van Wert County Land Reutilization Corporation (land bank) to the city. A building previously located on the property has been demolished as part of the land bank program, with the city using the land as green space on East Main Street. Council also approved an ordinance to change the jobs credit amount for development in Vision Park from $250 per job to $500 per job. During his report, Mayor Mazur noted that AEP’s smart electric meter project has been postponed until April, while Fleming noted that the city has interviewed several applicants for a city parks position. City Auditor Martha Balyeat noted that she was a “little concerned” about the fact that income tax collections in January were the lowest they have been since 2014. “It’s a little early to be concerned,” Balyeat said, noting that the lower collections could just be a matter of timing, rather than an indication of lower income tax receipts in 2019. Council also passed a then-and-now certificate totaling $17,500 for utility finance software purchased through Software Solutions. Fees for credit card purchases were also increased another $15 to $40 to offset fees charged the city by a third-party electronic vendor. The next meeting of Van Wert City Council will be at 6:30 p.m. Monday, February 25, in Council Chambers on the second floor of the Municipal Building, 515 E. Main St.